In a large bowl, with a wooden spoon, mix together the sugar, almond butter, coconut oil, vanilla and flax egg, until smooth. Then mix in the flour, soda, baking powder, and sea salt in until the mixture is smooth. 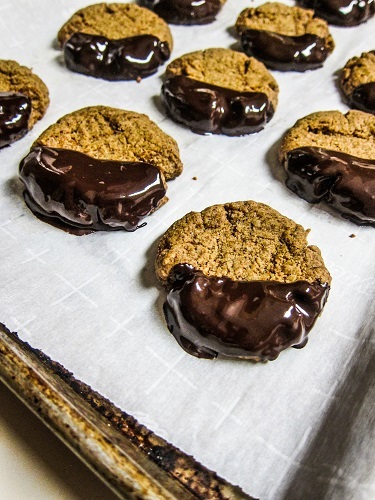 Melt the chocolate in the top of a double boiler (or your preferred method), and dip half of each of the cookies into the chocolate allowing the excess to drain off. Set on a parchment lined tray to set the chocolate (it will set faster if you pop them in the freezer for about 5 minutes). Enjoy!